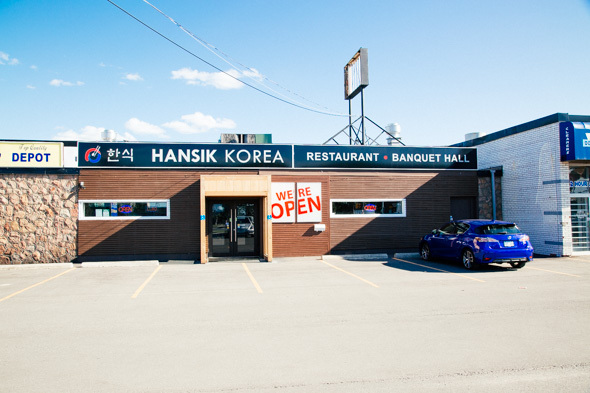 Hansik is an unassuming Korean restaurant along the North York Finch corridor. 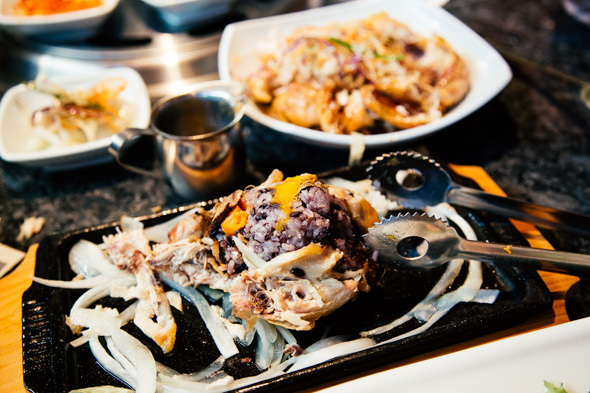 Combining traditional and modern takes on Korean cooking, Hansik's menu features classics like pork ribs and chicken galbi along with hot skillet combos, stews, soups, noodle dishes and bibimbap. I decide to splurge on one of Hansik's tasting menus ($59.99). You need to order this a day in advance, though there's a mini version ($49.99) available for walk-in customers. 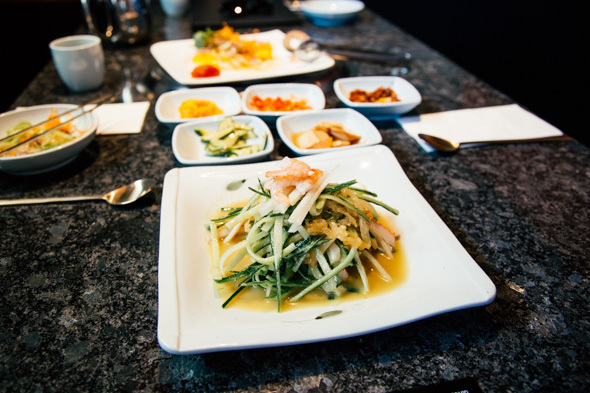 Butternut squash porridge, and apps such as housemade kimchi, mashed sweet potato, and other pickled and fermented veggie grubs start things off. 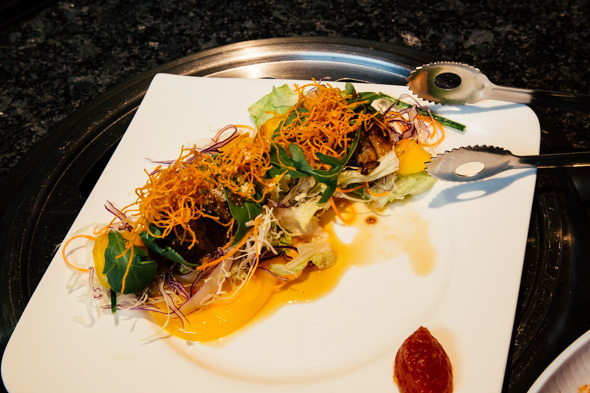 The meal ramps up with chicken mango salad - a tangle of dehydrated carrot, greens, slivers of mango, and juicy, dark meat. Next, a sweet and savoury jellyfish salad. The slightly crunchy texture of the sea creature goes well with the spears of a cucumber; and the shrimp is a nice touch. The Korean tacos are served colder than I'd like but are still delicious. 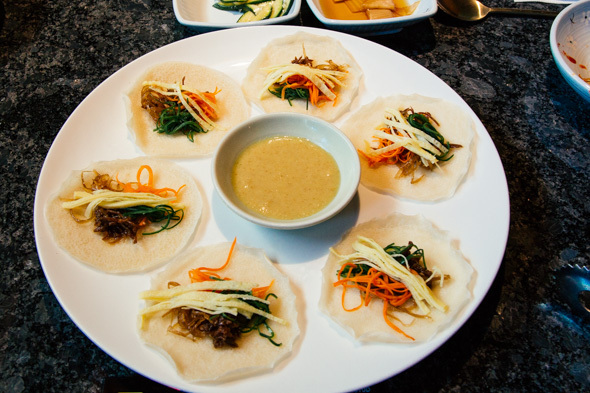 They come as flour tortillas layered with shredded cabbage, carrot and seaweed with spicy mustard. 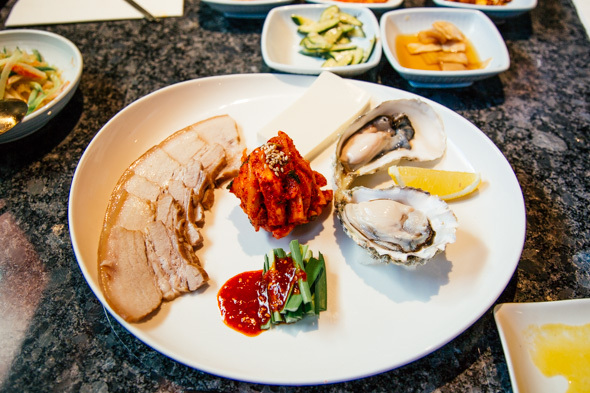 Next, the bossam - top an oyster with pork belly, tofu, and a chunk of the kim chi ball and devour in one gulp. 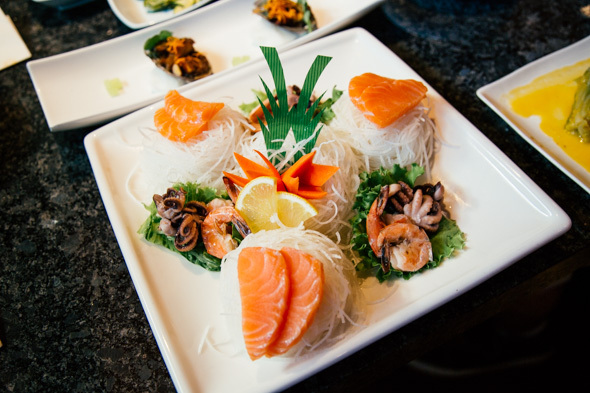 Only a couple of duds to mention - the salmon sashimi was still slightly frozen and the flour pancakes were bland, pale things. Good thing the rest of the meal overall was incredible. 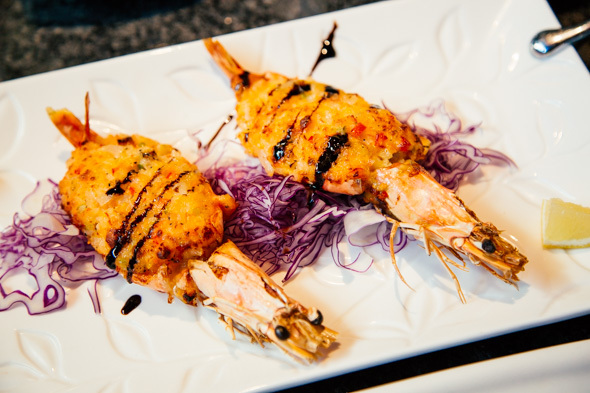 Baked jumbo prawn was minced into a cheesy mash and served in its salty husk. It was rich and delectable. The centrepiece of the meal was a roasted cornish hen. The manager decided to include this on the menu after seeing a Portuguese rotisserie stand in Korea. They cut open and shave the meat at the table, and inside there's a delicious pocket of red rice, mashed root vegetables, and ginseng. 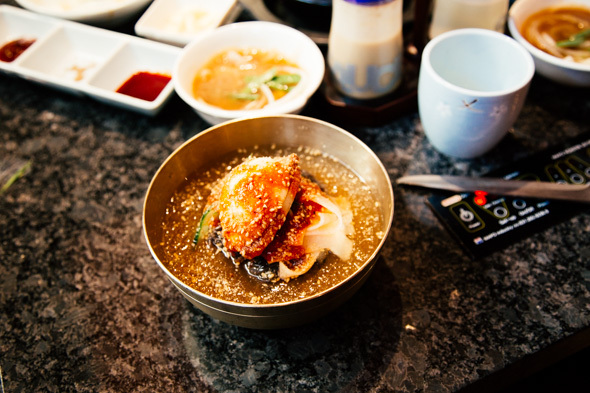 Bowls of naengmyeon are the last to arrive - a thick loop of starchy buckwheat potato noodles are scissored and topped with spicy mustard and sesame seeds. 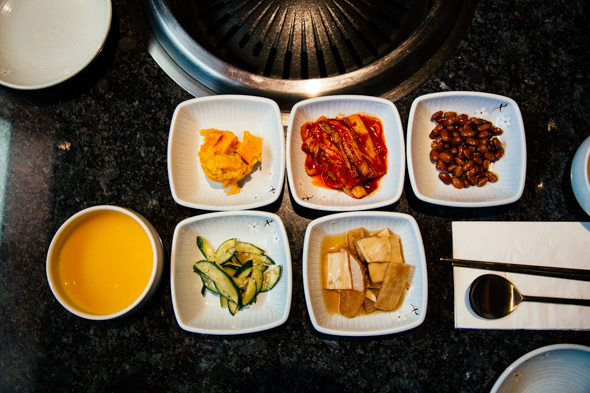 The manager claims Hansik is one of only a few Korean places in town that make their cold broth from scratch. 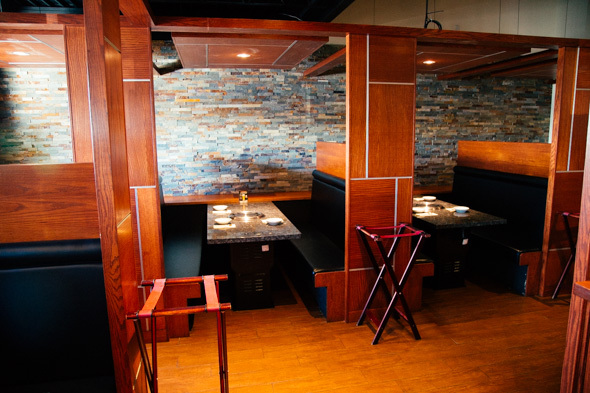 The main dining room is large, but I'd still suggest reserving ahead of time for lunch and dinner.